Yann Coppier composed, performed and produced all the tracks on this website at Studio Ovale, Copenhagen (except for the Pollen, Super 8, Installations, Violet River, WHOURKR and Audionauts albums, for which the work was shared) and has won several international prizes for his work. All the instruments were played by the producer except when notified – vocals, guitars, keyboards, percussions, programmations and electronics. As a composer and a musician he has been working with styles that range from electronica to death metal including electroacoustic music, contemporary jazz or rock. Which means recording albums and playing live, but also making music for movies, theater, contemporary dance, art installations, TV, commercials, motion graphics and Internet websites. As a sound engineer he has fully produced more than 30 bands including recording, mixing, remixes, mastering and consulting. As a specialized journalist he has written more than 100 articles for different magazines (lately KR Home Studio), and is doing conferences (IRCAM, SAE Institute Paris, Cité des Sciences et de l’Industrie, ArtLab…) on sound. As a teacher he is now head of the Sound department at the Danish National School of Performing Arts (Statens Scenekunstskole) in Copenhagen, Denmark, starting March 2014. 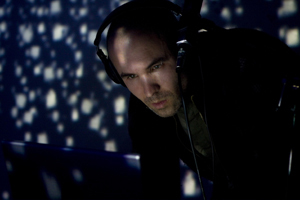 He has also been responsible for Sound and Digital Production at Sonic College in Haderslev, Denmark, since 2010, and has been responsible for pedagogy in the music school ATLA in Paris, France, teaching on the whole for 15 years music and sound production, studio techniques and music for movies. His main musical projects are -i snor (abstract acoustic/electronic), in which he does everything, WHOURKR, (death metal/electronica/breakcore), in which he sings and does some crazy electronics and production, and Pollen (contemporary acoustic duo), in which he plays the guitar and does the production. Finally he has also directed 8 art movies for his project -i snor, which come along with a highly aesthetical website.